Michelle Obama was First Lady of the United States for eight years from 2009 until 2017. She is famous for being the only African-American First Lady in US history, and also for her campaign to reduce childhood obesity. 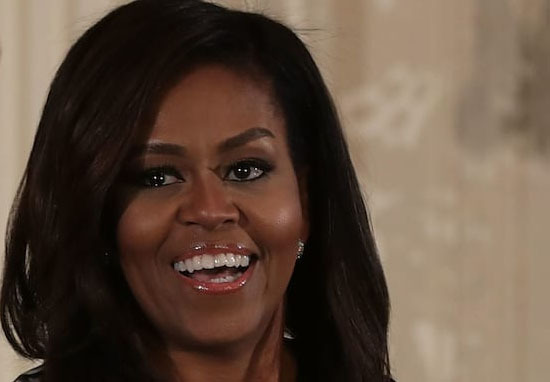 Who is Michelle Obama, how old is she, when is her birthday, how tall is she, what college did she attend, where was she born, does she have siblings and what is her background? Michelle Obama is most famous for being the First Lady of the United States of America (wife of the president) from 2009 until January 2017. She is 55 years old and was born on January 17 1964 in Chicago, Illinois. She is 1.8 metres tall and has an older brother, Craig. She grew up in a small apartment in Chicago’s South Shore. Her parents were strong believers in the value of education. She was a gifted pupil who always worked hard at school, moving onto Princeton University before studying law at Harvard. Why is Michelle Obama famous and what is her occupation? Michelle Obama is known for being the wife of the 44th US president, Barack Obama. She was First Lady from 2009 until January 2017. Before Barack Obama became president Michelle worked as a lawyer and then in public administration. What is Michelle Obama’s net worth? According to Forbes magazine, Barack and Michelle Obama are worth $20million. How much does Michelle Obama earn, did she get a salary when Barack Obama was president of the United States? Being the First Lady of the US is an unpaid position. She was provided with staff and transportation but was expected to provide her own clothes. In the year before Barack Obama was elected president, Michelle Obama earned $273,618 from the University of Chicago Hospitals, plus $51,200 as a member of the board of directors of TreeHouse Foods. She stopped both these paid positions on moving to the White House. How much does Michelle Obama weigh, what size dress does she wear? 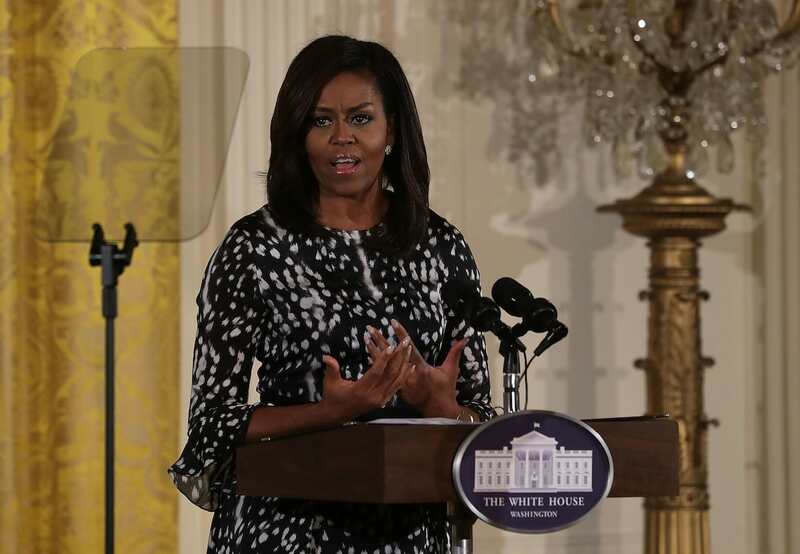 Michelle Obama reportedly weighs 170 pounds or 77kg and wears US dress size 8, which is a UK size 12. 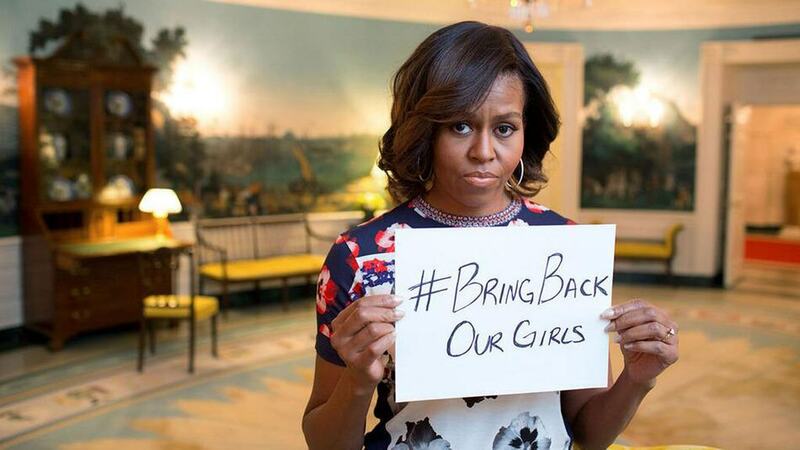 Is Michelle Obama running for president, is she running for president in 2020, can she run for president? A former first lady is eligible to run for president. In December 2016, in an in-depth interview with Oprah Winfrey, Michelle Obama confirmed she was not going to run for President in 2020. Why was Michelle Obama falsely accused of being a man? American far-right conspiracy theorist Alex Jones has claimed that she is a man and that comedian Joan Rivers was killed to cover this up. No evidence has been provided to support this theory. What did Michelle Obama do to school lunches, what school did she go to? The former first lady went to Whitney Young High School in Chicago. This was a selective state school for gifted youngsters and she spent three hours each day travelling to and from school. As part of her campaign to reduce childhood obesity which was called ‘Let’s Move’, Michelle Obama changed the types of foods included in school meals. This included increasing the amount of fruit and green vegetables and reducing the amount of salt and fat. These changes have since been rolled back by the Trump administration. Why is Michelle Obama called the ‘First Lady’, when did she become ‘First Lady’, how long was she ‘First Lady’ for, what did she do during her time in the role? First Lady is the title given to the wife of the current US president. Barack Obama’s wife was First Lady from January 2009 until January 2017. During her time in the role she focused on tackling childhood obesity through healthy eating and gardening as well as advocating for military families. What designers does Michelle Obama wear? She was known for wearing a mix of both designer and high street fashion. For both Inauguration Balls she wore evening gowns designed by Jason Wu. Other favourite designers include Tracy Reese, Thakoon, Sophie Theallet and Brandon Maxwell. When did Michelle and Barack Obama move into the White House, how long did they live there for? The couple lived in the White House for eight years from January 2009 until January 2017. What is Michelle Obama doing these days, how did she stay fit, does she wear a wig, what will she do now that Barack Obama is no longer president? She spent the first part of 2017 vacationing and recovering from life in the White House, and has recently agreed a book deal. She doesn’t wear a wig, but often uses conditioner to help straighten and manage her hair. She is committed to keeping fit, often doing cardio workouts and posting exercises on Twitter as part of her ‘GimmeFive’ campaign to encourage people to exercise. 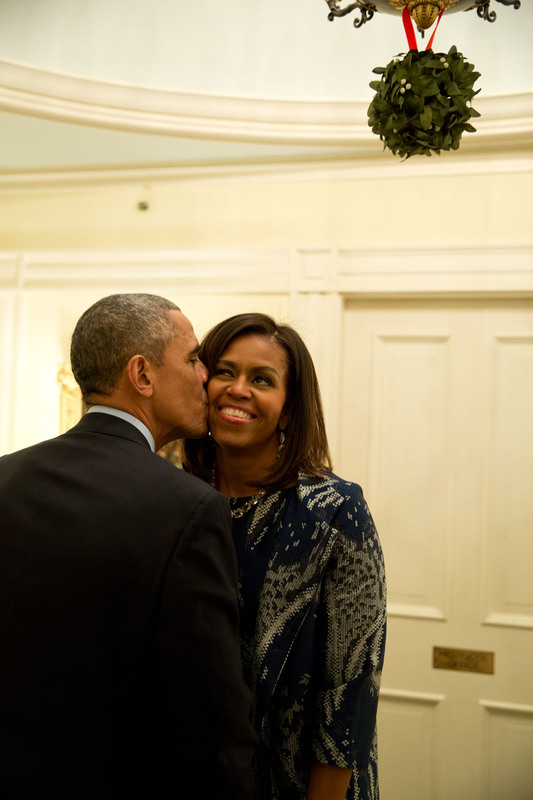 When did Michelle and Barack Obama get married, where did they get married, how did they meet? Barack Obama married Michelle Robinson on October 3 1992 at Trinity United Church of Christ in Chicago. They met when they both worked at the law firm Sidley Austin. Other than English, she does not speak any languages fluently. She did study French and speaks it at a basic level. Where does Michelle Obama live? Barack and Michelle Obama recently bought an eight bedroom house in Kalorama, Washington D.C. for $8.1million and plan to continue living in Washington D.C until younger daughter Sasha finishes school. Did Michelle Obama lose her license to practice law, when did she become a lawyer? Michelle Obama graduated from Harvard Law School in 1988. In 1993, the status of her law license was changed to inactive as she moved away from practising law. Who has Michelle Obama dated? There is no reliable information on Michelle Obama’s previous relationships. Does Michelle Obama have kids, what are their names? 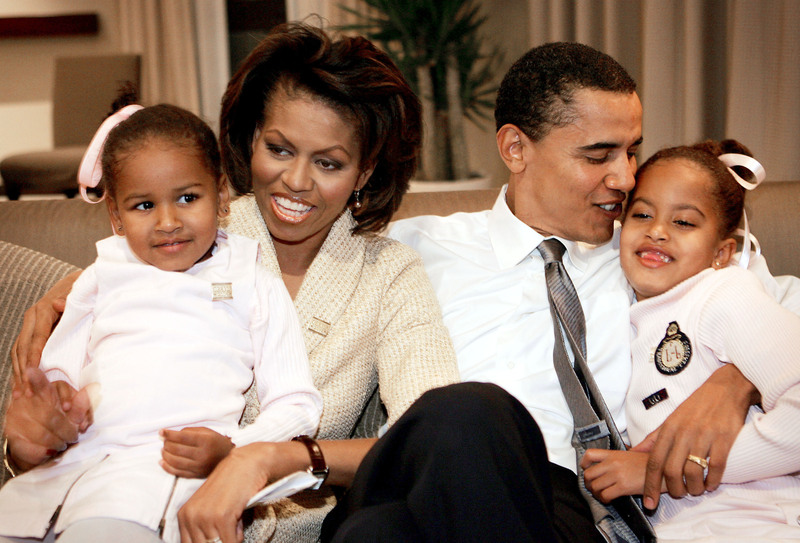 She and Barack Obama has two daughters, Malia born in 1998 and Natasha born in 2001 who is known as Sasha. How many houses does Michelle Obama own? The Obamas have four houses. Their primary residence is in Washington D.C., but they also have holiday homes in Rancho Mirage, California and another in Hawaii. They also own the home in Kenwood, Chicago that they lived in before Obama became president, though rumours persist that they plan to sell this home and buy one in New York after Sasha graduates from high school.